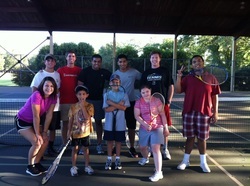 Aces for Athens is a growing volunteer organization that provides fun and free tennis lessons to kids of all abilities and disabilities in the local Athens community. If you like working with children, playing sports, or are just looking for a rewarding volunteer opportunity, our organization is perfect for you! We offer every volunteer a variety of opportunities to participate through different types of programs and let you pick the dates you want to volunteer! Feel free to add yourself to the Listserv!